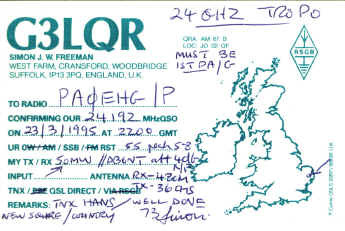 On 23 march 1995 I made the first 24 GHz QSO working G3LQR over a distance of 210 km. The idea started in 1993 to try and make the first ever QSO between the UK and PA. The first problem to face was the choice of frequency, which resulted in intensive discussion with several other Hams. Following the IARU recommendation to work on 24.048 MHz would demand extra effort in changing the equipment. At that time most active Hams were using 24.192 MHz. Choosing the recommended frequency of 24.048 MHz would need serious rebuild of the equipment on both sides. 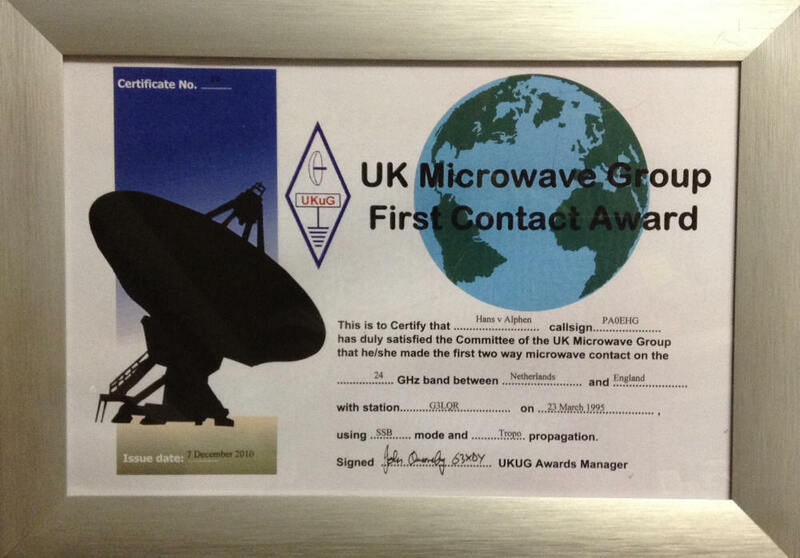 We chose to use 24.192 MHz for the experiments to start because this frequency was allowed in the UK. In autumn of 1993 I installed a 10 GHz and 24 GHz beacon at Schiphol airport. The purpose off the 10 GHz beacon was to be used as reference for possible propagation. From that moment on G3LQR started in monitoring the 24 GHz beacon whenever the 10 GHz beacon was stronger than normal. Many attempts to copy the 14 GHz signal failed. In 1994 the system of G3LQR was able to transmit on 24 GHz so from that moment on a possible two way contact could be possible. In the summer of 1994 two attempt to try a contact were tested. PA0EHG travelled to the Dutch coast for testing. The first test was from Noordwijk using 10 GHz as talkback frequency. Although signals on 10 GHz were strong we did not succeed in finding any 24 GHz signals from each other. 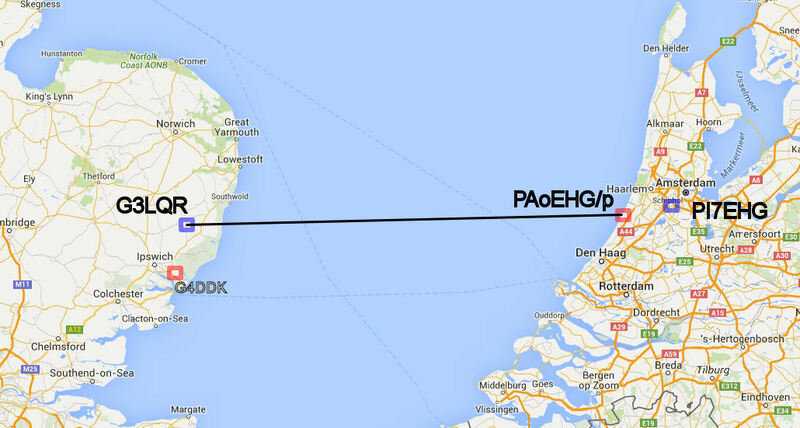 A few weeks later PA0EHG travelled to the Dutch coast from Westcapelle resulting in a trajectory reduction of 40 km. With this shorter trajectory we could win about 4 to 8 dB in signal strength which perhaps would be just enough to make the contact possible. Unfortunately this attempt also failed. Signals on 10 GHz were extreme strong with even strong signals using open waveguide and no antenna mounted. We were convinced that a QSO on 24 GHz should be possible but after several hours testing we stopped at 00.30 LT. A drive of more than 5 hours up and down the coast was for nothing. Both operators were disappointed and we discussed how to continue. We agreed that we needed more transmit power and more experiments during winter period. As result of the experiments with G3LQR ad my participation on the microwave activity week in Denmark I decided to build a new system for 24 GHz. Investments in mechanical parts and semiconductors were made to build up this new setup. On 23 December, during a cold winter day, Simon G3LQR noticed the 10 GHz beacon from Schiphol becoming stronger and stronger. Unexpected he found the 24 GHz beacon signal from Schiphol as well. He tried to trace PA0EHG but he could not be reached. By the time Simon found me the conditions were over and the 24 GHz signal from Schiphol was lost. These first signals were a stimulance for both to work even harder on a the system improvement. PA0EHG started with a already planned improved 24 GHz beacon for Schiphol. The new beacon was installed on February 1995 with 100mW output and a 32 dB antenna gain from a 25 cm dish. With this new beacon it improved ERP by 15 dB but it also needed a much more precise alignment. From the location of the beacon, on top of the air traffic control tower at Schiphol airport, it was not possible to have visual references outside. Using a compass is also not possible on top of a almost 100mtr high concrete tower. The beacon was first aligned to the home QTH of PA0EHG and after that it was aimed at G3LQR using a precise offset angle. Very fast after the new beacon was operational it was heard by G3LQR. The beacon was heard on March 14 for the first time. Weather at that time was quiet but visibility poor with high humidity and a front passage was on the way. We decided not to take a test a QSO because the beacon faded fast and I had not enough time to travel to the coast. Both stations, from that moment on, monitored the weather situation well and both were hopeful for the 23 off March. 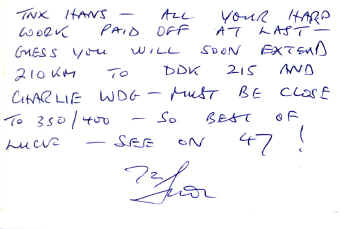 On 20.35 LT Simon called me on 70 cm that he was hearing the 24 GHz Schiphol signal. We waited for some time with the decision to travel to the coast to decide if we should try the test the next morning or this evening. Some time later Sam G4DDK also reported hearing the Schiphol 24 GHz beacon. On 21.45 LT PA0EHG and his XYL traveled to the coast of Noordwijk. After arrival he build up his station and we started with the talkback on 10 GHz. Strong signals on 24 GHz were the result, similar to previous tests we did before. After that Simon started a transmission on 24 GHz which was almost instantly found by PA0EHG. The received 24 GHz signal from Simon was relayed on 10 GHz so that Simon could optimize his antenna aiming. Then PA0EHG started transmitting and also his signal was received by Simon G3LQR. We exchanged reports from 5 and 5 (almost 30 dB above noise) we made an SSB QSO and exchanged al necessary details to have a valid QSO. This was done at 22.00 GMT. After that we continued with some testing and found that the signal was fading and sometimes lost in noise. Simeon also noticed that before on the 24 GHz Schiphol beacon. After the QSO we expressed our hope to make a QSO with each other on 47 GHz. Sam G4DDK was also listening to the signals from PA0EHG and after realigning the antenna to G4DDK the signal was a solid 59. Sam only had a transmitter from his bedroom window but unfortunately this was good enough to be copied at PA0EHG. Weather was becoming worse, the increasing wind combined with cold temperature were becoming worse and I had to stop further experiments. Time was already almost midnight so it was time to go home. What were the big differences which made this contact possible. First the beacon at Schiphol airport has been very important in the realization of this two way first contact. Without the beacon it would have been much more difficult. Improving the beacon power output from 20 mW to 100 mW and the increase of antenna gain from 25 to 32 dB have been a significant improvement which almost instantly resulted in success. The building of a new station also improved performance significantly. The new station is a dual band antenna for 10 and 24 GHz with the big advantage that if the 10 GHz antenna is aligned to max signal the 24 GHz antenna is almost correct aligned as well. The new station had also more power output with 100 mW. A unexpected but significant improvement was the better receive performance with a much better noise figure. This improved from 16 dB from the old system to 3.5 dB in the new one. We don't know if weather conditions were the reason for success. Due to the big improvements is system performance it's very well possible that during previous tests using the new equipment could be successful as well. It is known that on 24 GHz the traject loss is directly related to the amount of water in the atmosphere. This also has a relation to the temperature because the higher temperature is the more water is in the atmosphere with the same humidity. We need more testing because at times that the Schiphol beacon was heard by G3LQR we had low to poor visibility (so high humidity). During the summer period we will find how temperature and humidity influences the possibilities for cross channel contacts. With more contact being made, other amateurs also will be stimulated in building equipment. With the help off good beacons and setting up activity groups we can assist new comers. The introduction off good designs which can be reproduced by others is essential. DB6NT has made several designs which have proved to be reproducible and using components easy assessable. For a real discovery of the 24 GHz band possibilities we will need much more active stations being QRV from the home QTH. The delay and problems from being QRV from a portable location are a big handicap and will be responsible for missing many short lifts which can be noticed when activity is from the home QTH. I hope that activity will grow to a much higher level compared to the level we had on 10 GHz 15 years ago. We still need to solve the discussion on working frequency as IARU is still recommending 24.048 GHz as preferred frequency. Several years after this contact we all switched to 24.048 GHz. With more active stations we will have more cross channel contacts and probably also have larger distances on 24 GHz. This information paper was written by the RSGB for the IARU Region 1 conference held in September 1995. It describes the changes which have taken place in 24GHz operation in the UK in recent years. It is still very much applicable, and is included here, with one update - an additional note about the G3WDG/PA0EZ contact in 1997. Until recently, most operation on the 24GHz band was portable, mainly from hill and mountain top sites. In the UK, much of this operation had been using simple wideband FM equipment, with paths limited to line of sight of 100 to 150km distance. In the UK, there are now a number of home stations operational, using narrowband equipment with power levels of typically 50 to 150mW, and several up to 1W. The benefits of this have already been seen, with regular scheduled tests and beacon observation, and a number of long distance contacts made. The designs from DB6NT have been of especial importance in stimulating activity - the Mk II transverter , and low noise and high power amplifiers . The simple DB6NT Mk II transverter provides an easy way of getting operational on 24GHz. This design provides a basic receiver and very low power transmitter (typically 0.2 to 0.6mW) using a diode subharmonic mixer. Addition of a low noise amplifier and high power amplifier improves the system, with noise figures of typically 3 to 4 dB, and a power output of some 50 to 100mW or more achieved. The 12GHz local oscillator is typically generated using a G4DDK004 2.4GHz LO , followed by a G3WDG009 x5 multiplier [4 and photo below], providing a reliable 40 to 80mW output required at 12GHz. Simple narrowband equipment using a basic DB6NT Mk II transverter has superior capability than the typical wideband FM equipment used in the UK in the past. It seems likely that within the next few years, much of the UK operation will be using narrowband equipment. While most activity on the band was portable, this had the effect of limiting operation to those days when conditions look as if they may be good and two (or more) stations were able to travel to their respective sites. It is likely that good propagation days have been missed because of incorrect assumptions about good conditions. Regular fixed station operation, with regular scheduled contacts, or an effective programme of beacon observation are needed in order to determine the real nature of 24GHz propagation. The capability of the more advanced equipment, using powers of some 50mW to 1W, and noise figures down to around 3dB, allows many more paths to be tested with a chance of success. SSB QSO's have taken place over the G3WDG/G4DDK and G3WDG/G3LQR paths (circa 130km) with powers as low as 100mW, indicating that the present generation of low cost FET power amplifiers, HEMT LNA's together with modest 25cm dishes are adequate to ensure a reasonable operational range when conditions are right. Regular observation of the Schipol beacon PI7EHG on 24.192070GHz by several home stations located near the English east coast has already shown that super refraction at 24GHz does indeed occur over this mixed land/sea path. Observations by G3LQR (JO02QF) throughout the summer of 1994 revealed no signals. On 24/12/1994, PI7EHG appeared for about an hour at strengths up to S5. The distance from Schipol to G3LQR is about 250km, of which about 50km is overland at the Dutch end and 15km at the UK end. The weather was cold and clear with temperatures of around 05C at each end of the path. On 23/03/1995, the beacon was heard again, by both G3LQR and G4DDK (JO02PA). PA0EHG (the beacon keeper) travelled to the coast (JO22FF) and proceeded to work G3LQR for a first contact on the band between the UK and the Netherlands. The distance was 207km. G4DDK also heard PA0EHG at up to S9. At the time of these contacts the Schipol 10GHz beacon was up to 30dB over S9 at both G4DDK and G3LQR and although cold, the humidity was not judged to be particularly low. Indeed there was some low level mist at the UK end of the path. Since this first contact, QSO's have now been made by G4DDK with ON6UG/P in JO10 and JO11 at distances of 210 and 157km respectively. Contact has also been made between G4DDK and PA0EHG/P (215km, JO22ff) and between G4DDK and PA0EZ (JO22) at 268km. This last contact is notable as being between two home stations. Additional note: early in 1997, a new UK record was set when G3WDG (IO92RG) worked PA0EZ (JO22QF) over a distance of 391km on 24GHz. This is the first contact across the North Sea where both stations are located significantly inland. Long distance propagation is not limited to super refraction at 24GHz. G3WDG installed a high power (1W) attended beacon on 24GHz at his home to allow long distance reception tests to be made. Both G3LQR and G4DDK have heard this beacon at up to 30dBN (2.5kHz) over the 130km path when overland ducting on 10GHz has been present. G3LQR has also observed strong precipitation scatter over this same path during conditions of heavy hail/sleet. Signal levels were higher than by tropospheric ducting by several dB on this particular path. The tests have demonstrated the importance of stations in neighbouring countries operating in a common frequency band, and for these tests, in Northern Europe, 24.192GHz was used. There is long term concern that we are not using the primary allocation. The advent of narrowband equipment and home stations in the UK has meant regular tests and beacon monitoring has become possible over both inland paths and sea paths to nearby mainland Europe. These tests have resulted in significant new contacts being made, with super refraction, tropospheric ducting and precipitation scatter being observed. 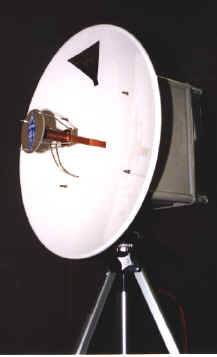 24GHz Transverter (MK II), Michael Kuhne DB6NT, Dubus 1/1993. Modules for 24GHz, Michael Kuhne DB6NT, Dubus 4/1993. Microwave Handbook Vol 2, Chapter 8, Sam Jewell G4DDK (Edited by Mike Dixon G3PFR), RSGB 1991.